Considerable amount of money spent in health care is used for treatments of lifestyle related, chronic health conditions, which come from behaviors that contribute to morbidity and mortality of the population. Back and neck pain are two of the most common musculoskeletal problems in modern society that have significant cost in health care. Yoga, as a branch of complementary alternative medicine, has emerged and is showing to be an effective treatment against nonspecific spinal pain. Recent studies have shown positive outcome of yoga in general on reducing pain and functional disability of the spine. The objective of this study is to conduct a systematic review of the existing research within Iyengar yoga method and its effectiveness on relieving back and neck pain (defined as spinal pain). Database research form the following sources (Cochrane library, NCBI PubMed, the Clinical Trial Registry of the Indian Council of Medical Research, Google Scholar, EMBASE, CINAHL, and PsychINFO) demonstrated inclusion and exclusion criteria that selected only Iyengar yoga interventions, which in turn, identified six randomized control trials dedicated to compare the effectiveness of yoga for back and neck pain versus other care. The difference between the groups on the postintervention pain or functional disability intensity assessment was, in all six studies, favoring the yoga group, which projected a decrease in back and neck pain. Overall six studies with 570 patients showed, that Iyengar yoga is an effective means for both back and neck pain in comparison to control groups. This systematic review found strong evidence for short-term effectiveness, but little evidence for long-term effectiveness of yoga for chronic spine pain in the patient-centered outcomes. Context: Suryanamaskar is a yogic practice widely practiced across India. Along with the available studies on physiology, there is a need to study its psychological effects. Aims: This research aims at studying the effects of suryanamaskar on relaxation dispositions (R-dispositions) among college students with high stress in Pune, India. Settings and Design: The present study was conducted in a college setting and used a randomized control group design. Materials and Methods: A group of 419 college students (age 17-22 years) were assessed on stress symptoms using the ABC relaxation theory. A total of 124 out of 419 students who were identified as high on stress were randomly assigned to an experimental and control group. And 40 participants each in both the group completed the program and were assessed on R-dispositions and stress dispositions before and after the suryanamaskar program. Statistical Analysis Used: Analysis of covariance (ANCOVA) was used to study the differences in R-dispositions and stress dispositions between the experimental and control groups. Results: The experimental group was found to be higher on the R-dispositions of physical relaxation, mental quiet, at ease/peace, rested and refreshed, strength and awareness and joy and lower on sleepiness, and stress dispositions−somatic stress, worry, and negative emotion compared with the control group. Conclusions: It was concluded that suryanamaskar is effective in leading to R-Dispositions like physical relaxation, mental quiet, at ease/peace, rested and refreshed, strength and awareness and joy and reduces sleepiness, somatic stress, worry and negative emotion at a dispositional level. Context: Pranayamas are breathing techniques that exert profound physiological effects on pulmonary, cardiovascular, and mental functions. Previous studies demonstrate that different types of pranayamas produce divergent effects. Aim: The aim was to compare the effect of 12 weeks of slow and fast pranayama training on pulmonary function in young, healthy volunteers. Settings and Design: This study was carried out in Departments of Physiology and ACYTER, Jawaharlal Institute of Postgraduate Medical Education and Research, Puducherry in 2011. 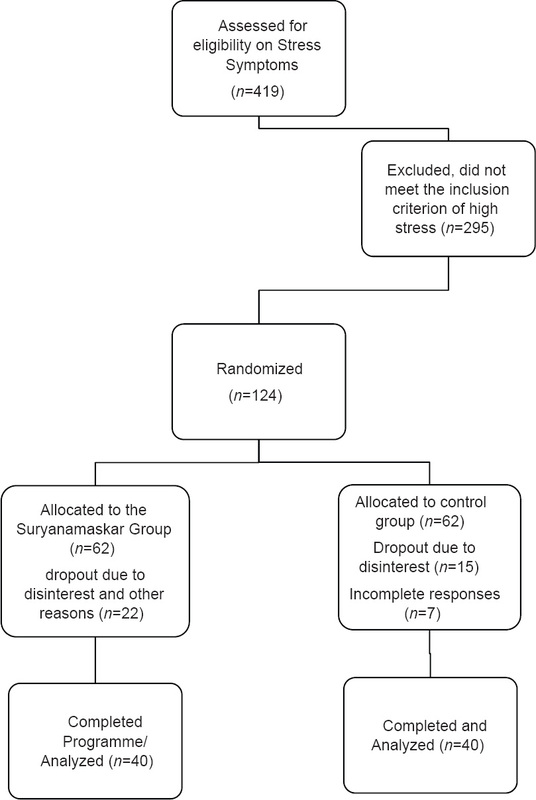 Subjects and Methods: Ninety one healthy volunteers were randomized into slow pranayama group (SPG), n =29, fast pranayama group (FPG), n = 32 and control groups (CG) (n = 30). Supervised pranayama training (SPG: Nadisodhana, Pranav pranayama and Savitri pranayama; FPG: Kapalabhati, Bhastrika and Kukkriya pranayama) was given for 30 min/day, thrice/week for 12 weeks by certified yoga instructors. Pulmonary function parameters (PFT) such as forced vital capacity (FVC), forced expiratory volume in first second (FEV 1 ), ratio between FEV 1 and FVC (FEV 1 /FVC), peak expiratory flow rate (PEFR), maximum voluntary ventilation (MVV), and forced expiratory flow 25-75 (FEF 25-75 ), were recorded at baseline and after 12 weeks of pranayama training using the computerized spirometer (Micro laboratory V1.32, England). Results: In SPG, PEFR, and FEF 25-75 improved significantly (P < 0.05) while other parameters (FVC, FEV 1 , FEV 1 /FVC, and MVV) showed only marginal improvements. In FPG, FEV 1 /FVC, PEFR, and FEF 25-75 parameters improved significantly (P < 0.05), while FVC, FEV 1 , and MVV did not show significant (P > 0.05) change. No significant change was observed in CG. Conclusion: Twelve weeks of pranayama training in young subjects showed improvement in the commonly measured PFT. 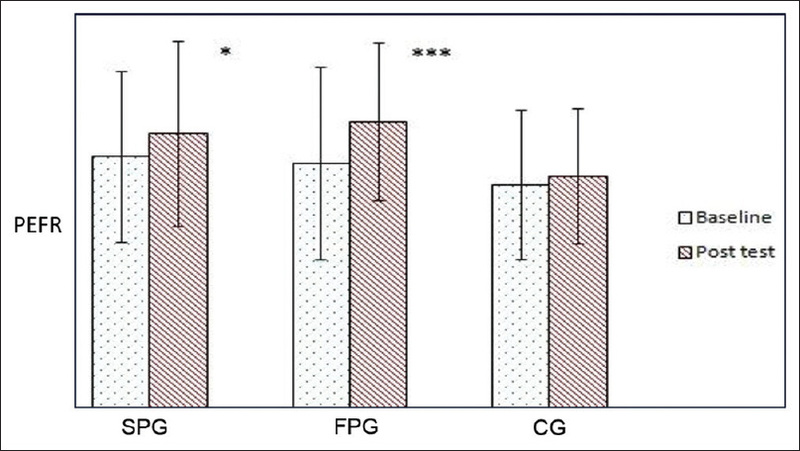 This indicates that pranayama training improved pulmonary function and that this was more pronounced in the FPG. Background: In India, obesity is highly prevalent in women as compared to men. As the obesity epidemic spreads, there are growing concerns about efficient obesity management. Aims: To compare between circuit training (CT), treadmill (TM) walking and suryanamaskar (SN) training in weight management and physical fitness enhancement in obese females. Settings and Designs: Comparative controlled study conducted in a community setting. Materials and Methods: 119 females of age between 20 and 40 years of body mass index (BMI) between 25.1 and 34.9 kg/m 2 . 87 participants completed the study. Group 1: CT; group 2: TM walking; group 3: Modified SN; group 4: Control. Outcome Measures: Body composition, cardio-respiratory and muscle endurance, flexibility. Statistical Analysis : Within-group data was analyzed with the paired t-test. P =0.05. Analysis between the groups was done using one way ANOVA test. Analysis between the groups was done using ANCOVA test controlling for baseline differences only for those variables that have significant differences at baseline. For those which do not have significant difference at baseline, RMANOVA was done at end of 8 weeks. Results: Reducation in mean body weight in CT group (2.2%), TM (1.7%) and SN (1.6%), (P < 0.05), BMI in all the three groups (P < 0.01), total body fat % in the CT (5%) and SN (3.7%), (P < 0.01), metabolic age with CT (2%) and TM (2%), (P = 0.001). Improvement in muscle mass in CT (4%, P = 0.009), VO 2max in CT group by 17.2%, SN (14%), TM group (8%) (P < 0.05). Upper limb Muscle endurance in CT (51.3%), SN group (51.24%) and in TM group (40%), (P = 0.05), in lower limb TM (21.2%) and SN (24.5%) (P = 0.05), flexibility in SN (12.4%, P = 0.0001). Conclusions: All three methods were effective in weight and physical fitness management. CT and SN were more effective in improving cardio-respiratory fitness and upper limb muscle endurance while only SN was effective in improving body flexibility. Background: Physiological benefits of yoga on volunteers of a particular age group are available. However, reports on efficacy of a specific yoga package on the populace of different age groups from similar occupational background is still very limited. Therefore, the present study was conducted to appraise the effect of a specific Hatha yoga package on anthropometric characteristics, flexibility and muscular strength of healthy individuals of different age groups from similar occupational trade. Materials and Methods: A total of 71 participants (Group All) from Indian Air Force ground personnel volunteered and age wise divided into 3 groups - (i) Group I (Gr. - I) (n1 = 27, 20-29 years), (ii) Group II (Gr. - II) (n2 = 21, 30-39 years) and (iii) Group III (Gr. - III) (n3 = 23, 40-49 years). All the participants undergone selected Hatha yoga training for 1 h daily for a period of 12 weeks. Parameters were recorded before and after the training. Pre and post training differences were assessed by Student's t-test. Results: Body weight (All, Gr. - II and Gr. - III [all P < 0.05]), body mass index (Gr. - II and Gr. - III [both P < 0.01]) and fat% (Gr. - II and III [both P < 0.05]) were decreased significantly. Neck circumference was increased significantly in Gr. - I (P < 0.05) but decreased significantly in Gr. - III (P < 0.05). Chest circumference (All (P < 0.001), in Gr. - I and II [both P < 0.05]), grip strength (All [left: P < 0.01 and right: P < 0.05], in Gr. - I [left: P < 0.05 and right: P < 0.01], in Gr. - II [right: P < 0.05] and in Gr. - III [left: P < 0.05 and right: P < 0.01]), back leg strength (group wise P < 0.001, P < 0.05, P < 0.01 and P < 0.05 respectively) and flexibility (all P < 0.001) were increased significantly. Summary and Conclusion: Hatha yoga can improve anthropometric characteristics, muscular strength and flexibility among volunteers of different age group and can also be helpful in preventing and attenuating age related deterioration of these parameters. Context: Incidence of breast cancer is very high among women around the world. Breast cancer patients experience cancer-related fatigue at some points during the treatment for breast cancer. Since cancer-related fatigue is of multifactorial origin, there are no evidence-based treatment strategies for fatigue. This study tested the effectiveness of certain pranayama techniques in reducing cancer-related fatigue among breast cancer patients undergoing radiation therapy. Aims: The objective of this study was to determine the effectiveness of pranayama on cancer-related fatigue among breast cancer patients undergoing radiation therapy as measured by cancer fatigue scale. Settings and Design: Shirdi Sai Baba Cancer Hospital and Research Center, Kasturba Hospital Manipal. 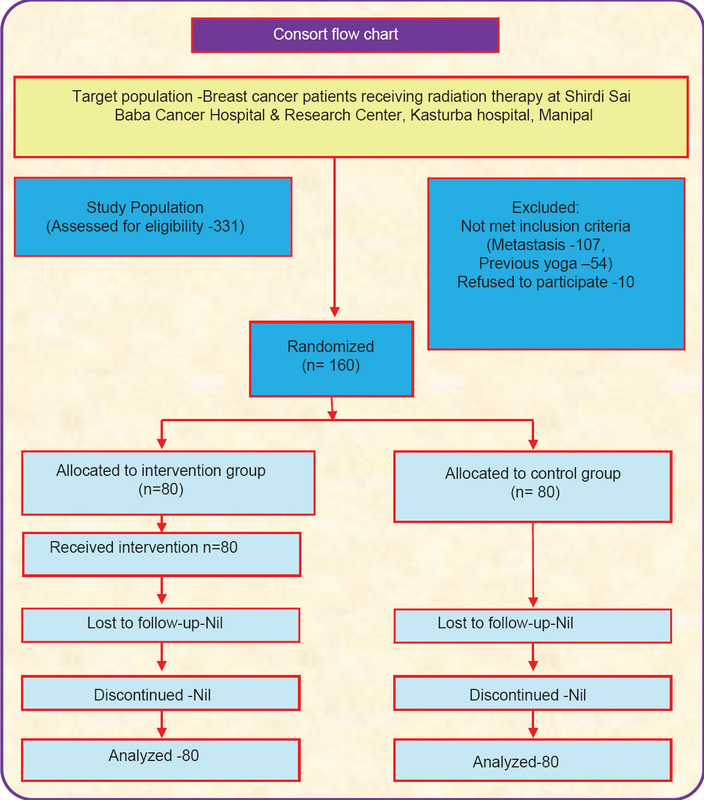 Materials and Methods: Study was a randomized controlled trial done among breast cancer patients receiving radiation therapy. Statistical Analysis Used: Demographic characteristics of the participants are presented as frequency and percentage. Comparison of means of cancer-related fatigue between the two groups is done by Mann-Whitney U-test and comparison of pre- and post-test means of cancer-related fatigue among the experimental group is done by Wilcoxon sign rank test. Results: There was a significant difference between the two groups with regard to the scores of cancer-related fatigue. The experimental group of patients who performed pranayama along with radiation therapy experienced less fatigue. Conclusions: Pranayama can be used as a supportive therapy for breast cancer patients undergoing radiation therapy. 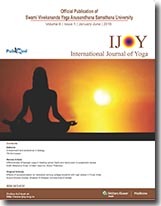 Introduction: Yoga used as a major component of integrative treatment protocol in 14 Indian village camps improved quality-of-life in 425 lymphatic filariasis patients. They experienced better mobility and reduced disability. This paper documents the gait abnormalities observed in lower limb lymphedema patients and the locomotor changes following integrative treatment. Materials and Methods: Yoga postures were performed as explained by traditional yoga practice in two sessions: Before ayurvedic oil massage without compression bandages and after the massage with compression bandages. Each yoga posture lasted for 5 min and the whole session ended in 45 min. Throughout each session, we advised patients to do long, diaphragmatic breathing, concentrating on each breath. The flexion of joints was coordinated with exhalation and extension with inhalation. We educated the patients to do longer expiration than inspiration. Results and Discussion: A total of 98 patients (133 limbs) attending the 6 th month follow-up were evaluated. The most common gait abnormality was antalgic gait. Structural and functional abnormalities were observed in hip, knee and ankle joints. We found that yoga as an adjunct to other components in integrative treatment improved the gait problems. 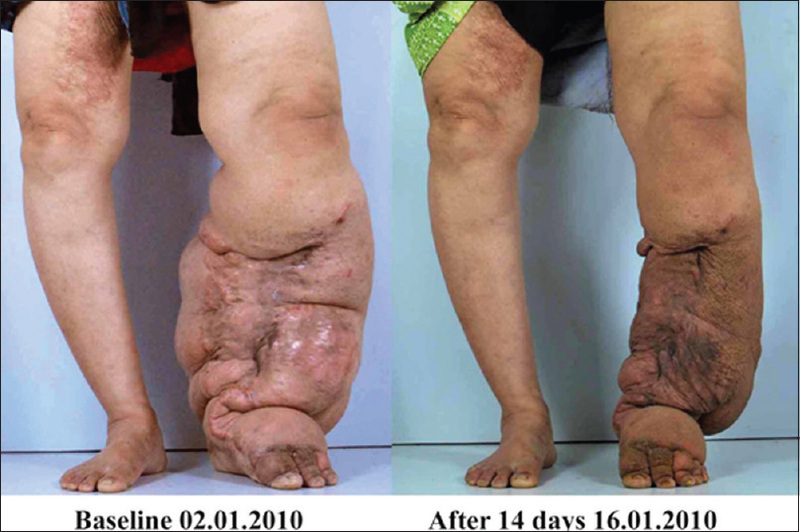 Long standing lymphedema caused altered gait and joint deformities. This was mostly due to inactivity causing muscle weakness and edema within and around the muscles. Both large and small limbs have shown significant volume reduction (P < 0.01) during follow-up after 6 months. Conclusion: There can be a mixed etiology for gait related problems in lymphedema patients. Further studies are recommended to understand the causes of deformities in lymphedema patients and an exact role of yoga. Background: Lung functions are found to be impaired in coronary artery disease (CAD), congestive heart failure, left ventricular dysfunction, and after cardiac surgery. Diffusion capacity progressively worsens as the severity of CAD increases due to reduction in lung tissue participating in gas exchange. Aims and Objectives: Pranayama breathing exercises and yogic postures may play an impressive role in improving cardio-respiratory efficiency and facilitating gas diffusion at the alveolo-capillary membrane. This study was done to see the effect of yoga regimen on lung functions particularly diffusion capacity in CAD patients. Materials and Methods: A total of 80 stable CAD patients below 65 years of age of both sexes were selected and randomized into two groups of 40 each. Group I CAD patients were given yoga regimen for 3 months which consisted of yogic postures, pranayama breathing exercises, dietary modification, and holistic teaching along with their conventional medicine while Group II CAD patients were put only on conventional medicine. Lung functions including diffusion capacity were recorded thrice in both the groups: 0 day as baseline, 22 nd day and on 90 th day by using computerized MS medisoft Cardio-respiratory Instrument, HYP'AIR Compact model of cardio-respiratory testing machine was manufactured by P K Morgan, India. The recorded parameters were statistically analyzed by repeated measures ANOVA followed by Tukey's test in both the groups. Cardiovascular parameters were also compared before and after intervention in both the groups. Results: Statistically significant improvements were seen in slow vital capacity, forced vital capacity, peak expiratory flow rate, maximum voluntary ventilation, and diffusion factor/ transfer factor of lung for carbon monoxide after 3 months of yoga regimen in Group I. Forced expiratory volume in 1 st sec (FEV 1 ), and FEV 1 % also showed a trend toward improvement although not statistically significant. HR, SBP and DBP also showed significant improvement in Group-I patients who followed yoga regimen. Conclusions: Yoga regimen was found to improve lung functions and diffusion capacity in CAD patients besides improving cardiovascular functions. Thus, it can be used as a complimentary or adjunct therapy along with the conventional medicine for their treatment and rehabilitation. Objectives: To compare the immediate effect of mind sound resonance technique (MSRT) with supine rest (SR) on state anxiety and psychomotor performance in 15 (eight male and seven female) right-handed generalized anxiety disorder patients (GAD) with an age range of 34.8 ± 12.8 years. Materials and Methods: Self as control design was followed. Diagnosis of GAD was made by a psychiatrist using sections of the Mini International Neuropsychiatric Interview (MINI). Participants practiced MSRT or SR (as control intervention) for 30 min at the same time for two consecutive days. The sequence of intervention was assigned randomly to the participants. State anxiety was assessed using state trait anxiety inventory (STAI; Form X1). Digit letter substitution task (DLST) was used to assess psychomotor performance, which involves visual scanning, mental flexibility, sustained attention, psychomotor speed and speed of information processing. Intervention was given in a quiet dark room on an empty stomach. Subjects received a training of MSRT and SR for 1 week before the data were taken. A pre-recorded audiotape was used to administer the technique of MSRT. Difference in scores after baseline and intervention was used to check normality, and was found to be normally distributed by the Kolmogrov-Smirnov test. The changes in STAI, DLST and difference in scores before and after two interventions (MSRT and SR) were compared using the paired samples t test. Results: As compared with baseline, STAI scores reduced and DLST scores increased significantly (STAI; P < 0.01; DLST; P < 0.01) after MSRT. After SR, there was a significant reduction in STAI scores from baseline (STAI; P < 0.05), but there was no significant change in the DLST scores (P = 0.26). Comparison of the difference in scores for DLST and STAI before and after the two interventions (MSRT and SR) showed a significantly higher score for DLST (P < 0.05) and a significantly lower score for STAI (P < 0.01) for MSRT as compared with SR. Conclusion: This pilot study suggests that MSRT may have a potential role in reducing state anxiety and enhancing psychomotor performance in patients suffering from GAD immediately after the practice. These findings need confirmation from studies with a larger sample size and randomized controlled design, which are implicated in the future. Background: Exercise can be beneficial for cardiopulmonary, musculoskeletal or neurological systems, and other factors including mood, and may be beneficial in reducing fall risks, dementia and variables associated with quality of life (QOL). Parkinson's disease (PD) produces progressive motor and cognitive deterioration that may leave those inflicted unable to participate in standard exercise programs. Alternative forms of exercise such as yoga may be successful in improving physical function, QOL and physiological variables for overall well-being. Aim: This randomized controlled pilot study investigated the effectiveness of yoga intervention on physiological and health-related QOL measures in people with PD. 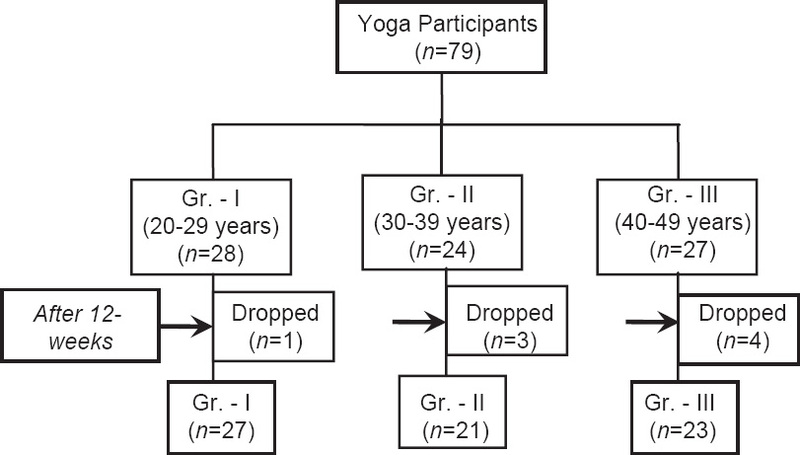 Methods and Materials: Thirteen people with stage 1-2 PD were randomized to either a yoga (n = 8) or a control group (n = 5). The yoga group participated in twice-weekly yoga sessions for 12 weeks. Participants were tested at baseline, and at 6 and 12 weeks using the Unified Parkinson's Disease Rating Scale (UPDRS), clinical measures of health-related QOL and physiological measures. Results: Significant improvement in UPDRS scores (P = .006), diastolic blood pressure (P = 0.036) and average forced vital capacity (P = 0.03) was noted in the yoga group over time. Changes between groups were also noted in two SF-36 subscales. Positive trends of improvement were noted in depression scores (P = 0.056), body weight (P = 0.056) and forced expiratory volume (P = 0.059). Yoga participants reported more positive symptom changes including immediate tremor reduction. Conclusions: The results suggest that yoga may improve aspects of QOL and physiological functions in stages 1-2 PD. Future larger studies are needed to confirm and extend our findings of the effects of yoga in PD.